For Islamic term, see Adab (behavior). Adab or Udab (Sumerian: 𒌓𒉣𒆠 Adabki, spelled UD.NUNKI) was an ancient Sumerian city between Telloh and Nippur. It was located at the site of modern Bismaya or Bismya in the Wasit Province of Iraq. Initial examinations of the site of Bismaya were by William Hayes Ward of the Wolfe Expedition in 1885 and by John Punnett Peters of the University of Pennsylvania in 1890, each spending a day there and find one cuneiform table and a few fragments. Walter Andrae visited Bismaya in 1902, found a table fragment and produced a sketch map of the site. Excavations were conducted there for a total of six months, between Christmas of 1903 and June 1905, for the University of Chicago, primarily by Dr. Edgar James Banks, with the final part of the dig being under engineer Victor S. Persons. It proved that these mounds covered the site of the ancient city of Adab (Ud-Nun), hitherto known only from the Sumerian king list and a brief mention of its name in the introduction to the Hammurabi Code. The city was divided into two parts by a canal, on an island in which stood the temple, E-mach, with a ziggurat, or stepped tower. It was evidently once a city of considerable importance, but deserted at a very early period, since the ruins found close to the surface of the mounds belong to Shulgi and Ur-Nammu, kings of the Third Dynasty of Ur in the latter part of the third millennium BC, based on inscribed bricks excavated at Bismaya. Immediately below these, as at Nippur, were found artifacts dating to the reign of Naram-Suen and Sargon of Akkad, c. 2300 BC. Below these there were still 10.5 metres (34 ft) of stratified remains, constituting seven-eighths of the total depth of the ruins. Besides the remains of buildings, walls and graves, Dr. Banks discovered a large number of inscribed clay tablets of a very early period, bronze and stone tablets, bronze implements and the like. Of the tablets, 543 went to the Oriental Institute and roughly 1100, mostly purchased from the locals rather than excavated, went to the Istanbul Museum. The latter are still apparently unpublished. But the two most notable discoveries were a complete statue in white marble, apparently the earliest yet found in Mesopotamia, now in the Istanbul Archaeology Museums, bearing the inscription, translated by Banks as "E-mach, King Da-udu, King of, Ud-Nun"; and a temple refuse heap, consisting of great quantities of fragments of vases in marble, alabaster, onyx, porphyry and granite, some of which were inscribed, and others engraved and inlaid with ivory and precious stones. Of the Adab tablets that ended up at the University of Chicago, sponsor of the excavations, all have been published and also made available in digital form online. Of the purchased tablets sold piecemeal to various owners, a few have also made their way into publication. Though the Banks expedition to Bismaya was well documented by the standards of the time and many objects photographed, no final report was ever produced due to personal disputes. Recently, the Oriental Institute has re-examined the records and objects returned to the institute by Banks and produced a report. There is a Sumerian comic tale of the Three Ox-drivers from Adab. Male bust, perhaps Lugal-kisal-si, king of Uruk. Limestone, Early Dynastic III. From Adab (Bismaya). A group of tells or settlement mounds are what remains of the ancient city. The mounds are about 1.5 kilometres (0.93 mi) long and 3 kilometres (1.9 mi) wide, consisting of a number of low ridges, nowhere exceeding 12 metres (39 ft) in height, lying somewhat nearer to the Tigris than the Euphrates, about a day's journey to the south-east of Nippur. Adab was occupied from at least the Early Dynastic period. According to Sumerian text Inanna's descent to the netherworld, there was a temple of Inanna named E-shar at Adab during the reign of Dumuzid of Uruk. In another text in the same series, Dumuzid's dream, Dumuzid of Uruk is toppled from his opulence by a hungry mob composed of men from the major cities of Sumer, including Adab. A king of Kish, Mesilim, appears to have ruled at Adab, based on inscriptions found at Bismaya. 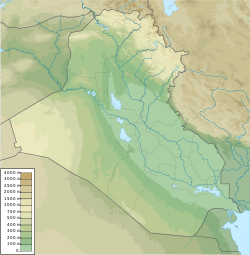 One king of Adab, Lugal-Anne-Mundu, appearing in the Sumerian King List, is mentioned in few contemporary inscriptions; some that are much later copies claim that he established a vast, but brief empire stretching from Elam all the way to Lebanon and the Amorite territories along the Jordan. Adab is also mentioned in some of the Ebla tablets from roughly the same era as a trading partner of Ebla in northern Syria, shortly before Ebla was destroyed by unknown forces. A marble statue was found at Bismaya inscribed with the name of another king of Adab, variously translated as Lugal-daudu, Da-udu, Lugaldalu, and Esar. Brick stamps, found by Banks during his excavation of Adab state that the Akkadian ruler Naram-Suen built a temple to Inanna at Adab, but the temple was not found during the dig, and is not known for certain to be E-shar. Several governors of the city under Ur III are also known. While no later archaeological evidence was found at Bismaya, the excavations there were brief, and there were later epigraphic references to Adab, such as in the Code of Hammurabi. ^ The Sumerian King List. Accessed 15 Dec 2010. ^ The Cambridge Ancient History. Vol. 1. Part 1. Prolegomena & Prehistory. One or more of the preceding sentences incorporates text from a publication now in the public domain: Peters, Rev. John Punnett (1911). "Bismya" . In Chisholm, Hugh. Encyclopædia Britannica. 4 (11th ed.). Cambridge University Press. p. 11. Recent article on Edgar James Banks in "World and I"